We first do some setup work, mainly about setting options that control the appearance of the plots. Notice that if you create plots in PNG format (the default format for HTML output), it is strongly recommended to use the CairoPNG device rather than the default png, since the latter one could produce quite ugly plots when using showtext. Then we can load showtext package and add fonts to it. Details about font loading are explained in the introduction document of showtext and also in the help topic ?sysfonts::font.add. While searching and adding fonts may be a tedious work, package sysfonts (which showtext depends on) provides a convenient function font.add.google() to automatically download and use fonts from the Google Fonts repository (https://www.google.com/fonts). 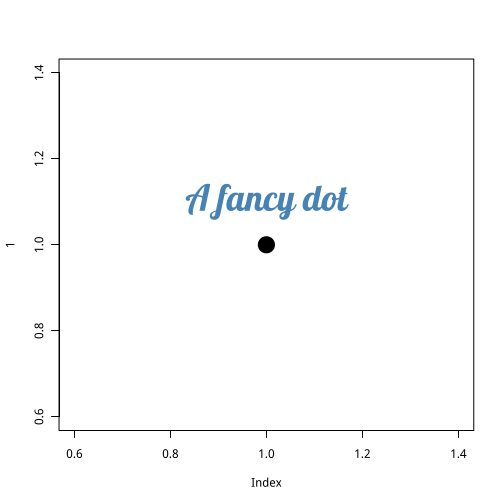 The first parameter is the font name in Google Fonts and the second one is the family name that will be used in R plots. After adding fonts, simply set the fig.showtext option in the code block where you want to use showtext, and then specify the family name you just added.